Unbelievable! 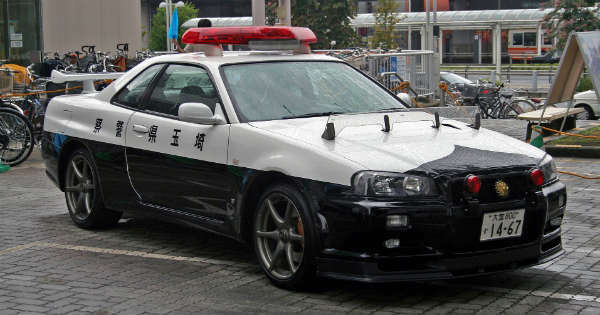 The R34 GT-R Police Car Actually Exists! - Muscle Cars Zone! Unbelievable! The R34 GT-R Police Car Actually Exists! The police worldwide have chosen some absolutely amazing cars to be in their service for a while, but no one believed the story that came out couple of years ago that a Nissan GT-R, the Japanese beauty, was supposed to be used as a police car. There were many speculations whether this was true or not, and many thought that it was just a propaganda. But wait a minute! We check out a video in which a man managed to capture this Nissan R34 GT-R rolling on the streets and still in service on the Kan-Etsu expressway. Yes, this piece of rare beauty really does exist despite all the dilemmas that have been going on. The man was super excited to come across this rare sight so he decided to film it. At one point of the video he even says that the R34 GT-R was so fast that he simply could not keep in touch with it. The car is equipped with every piece of equipment a normal police car would have, with only one major difference. This Nissan R34 GT-R can outrun every other police car. Just image the car in action as it chases the villain down the highway. What a spectacular thing that would be. Unfortunately, the police car stops soon after and so our wish to see more vanishes. Nonetheless, coming across this beautiful car is certainly rare and this man was lucky enough to do so. What`s your view on it? At last, follow this link to read about one foolish attempt for stealing a police car in Japan!